Hello, welcome to the blog. 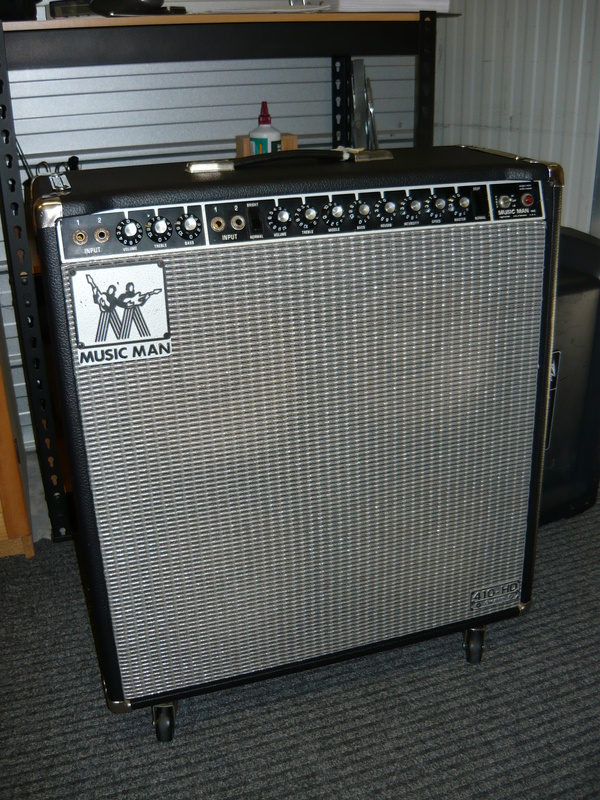 In the past few months we have completed major overhauls to a pair of 1970’s Musicman combo’s. 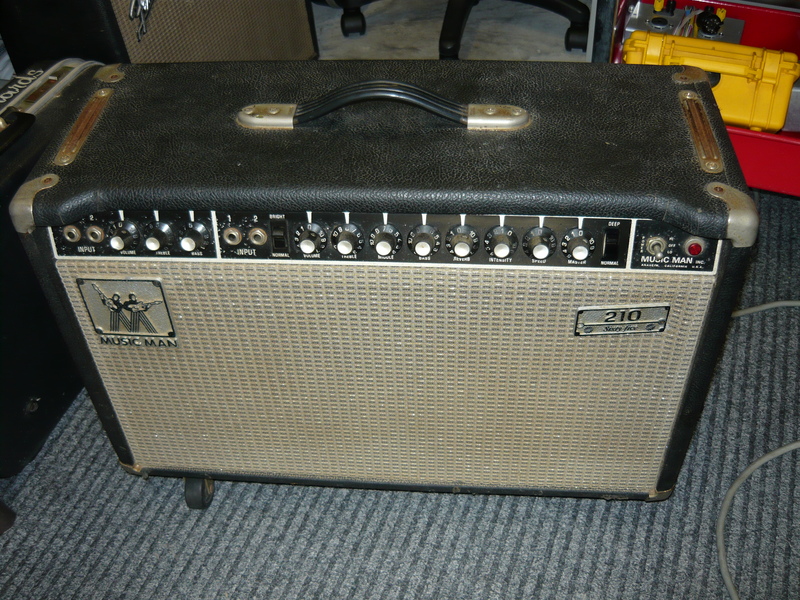 You might remember we published a blog last year regarding a major overhaul to a Musicman amp, which still belonged to its original owner. That particular blog has received hundreds of hits and continues to be read on a regular basis, so we are now attracting Musicman repair & restoration work from around the place, which is very gratifying. 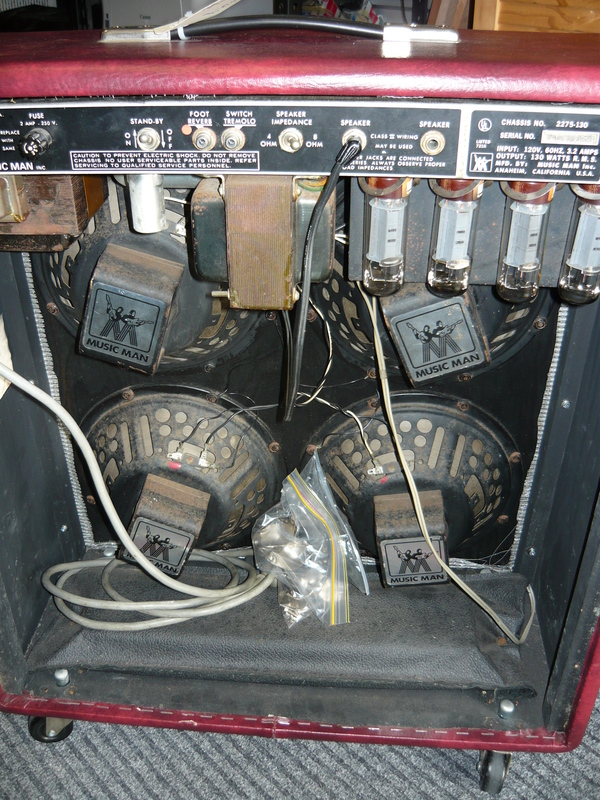 We have always had a high regard for the quality of construction, and the serviceability of these amps. Nearly 40 years after they were released on to the market, they are still capable of giving reliable performance, they just need some TLC from time to time, like any valve (tube) amp. 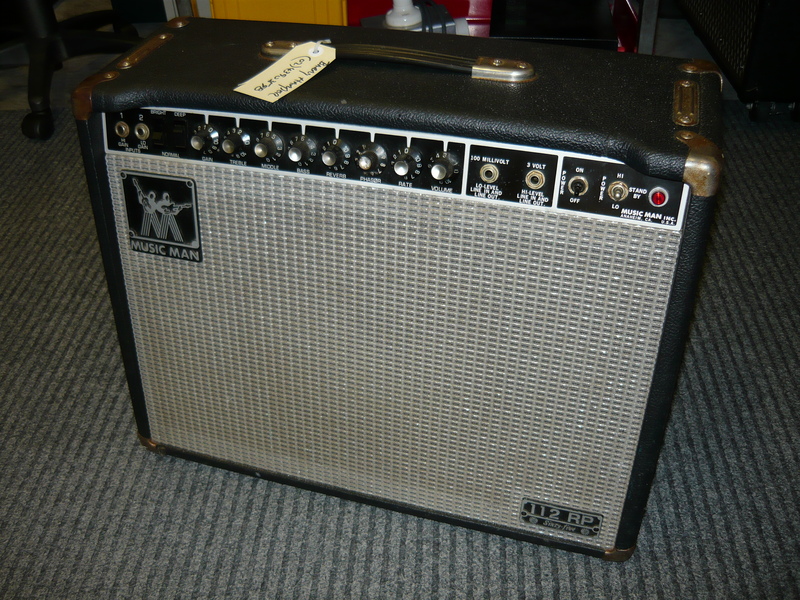 Our first example is the 2×10 65 watt model, possibly from around 1976. This was sent up from Sydney by Bondi Intermusic with the stated fault: lights up – no power. You can see in the photo that the model number badge is attached in the wrong place on the front grille. We discovered that this was done to hide a hole in the grille material. It didn’t take too long to realise why there was nil output from this amp, even though the amp was powering up, and the valves (tubes) were clearly operational. 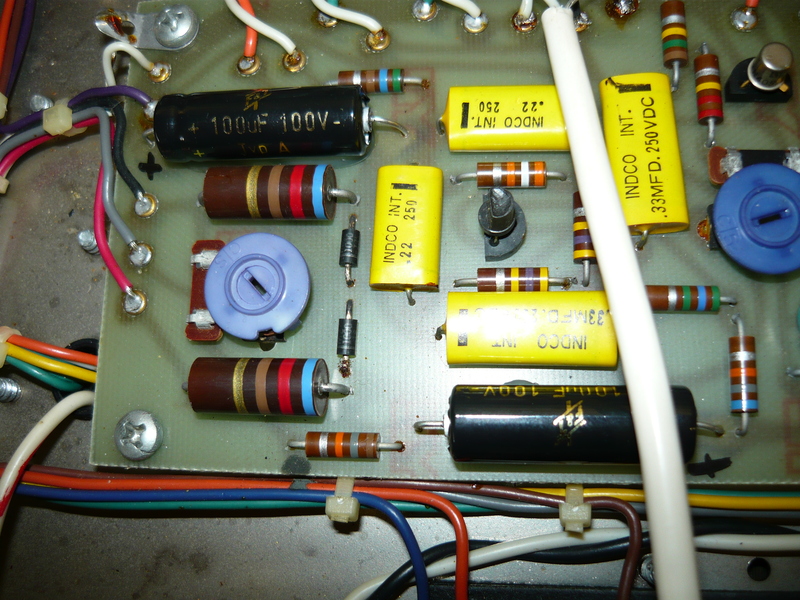 The low voltage supply had failed due to a short-circuit component, which means the preamp was no longer functional. The completely solid-state preamp relies on + & – 16V DC rails to operate. These DC voltages are smoothed & regulated by a simple circuit which includes filter capacitors and zener diodes acting as shunt regulators. 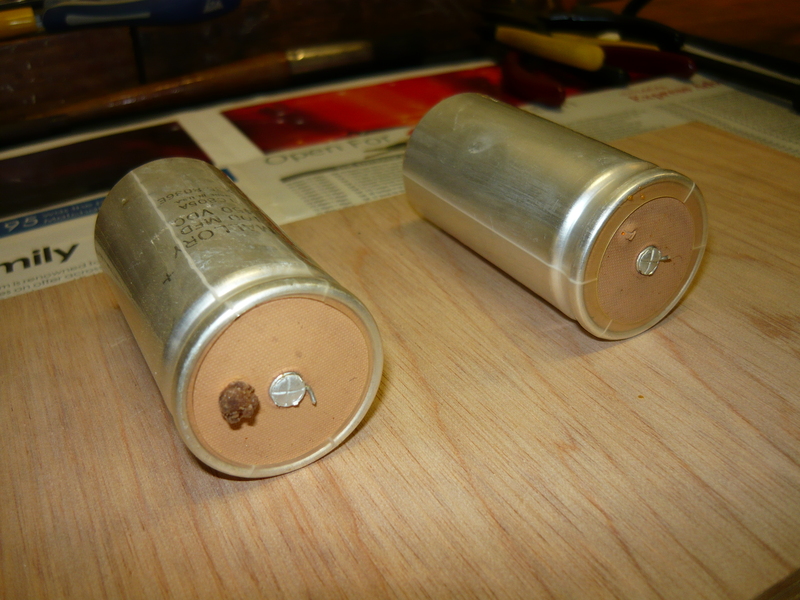 Examination of the various circuit boards suggested that all the power supply filter capacitors (ie, electrolytic), for both high voltage & low voltage supplies, plus the pair of zener diodes should be replaced. 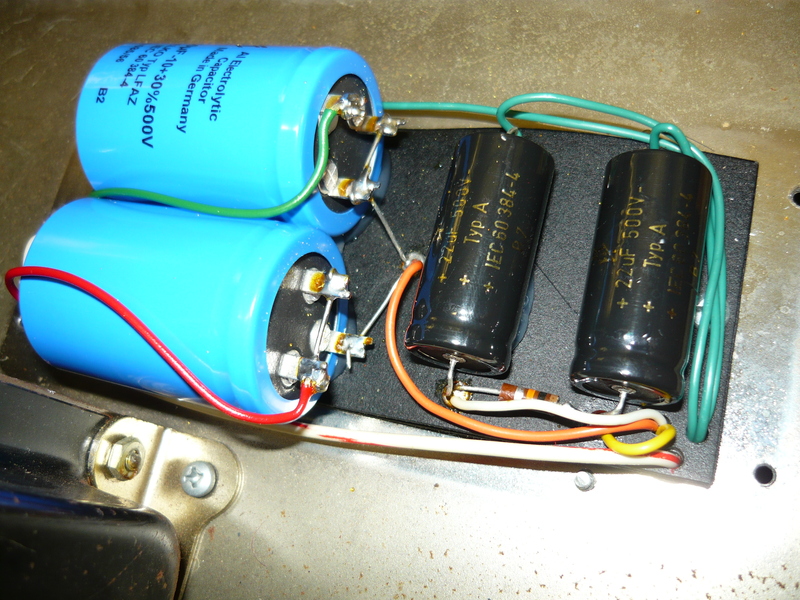 As the photos indicate, the various electrolytic capacitors have now been replaced using the very fine F&T brand caps from Germany, bedded down in some silicone (neutral-cure) for best stability. There are actually three boards within the chassis requiring this work, plus the main high voltage caps mounted within a “can” on the outside of the chassis. There were numerous other issues to be resolved, for example the amp failed the earth test, but the replacement of the 240V 3-pin plug fixed this. All jacks were cleaned with DeOxit and all pots were cleaned with FaderLube. The “deep” switch was cutting in & out, luckily we had a black plastic rocker switch available that was an exact fit. Nil reverb effect required removal & repair of the reverb springline. 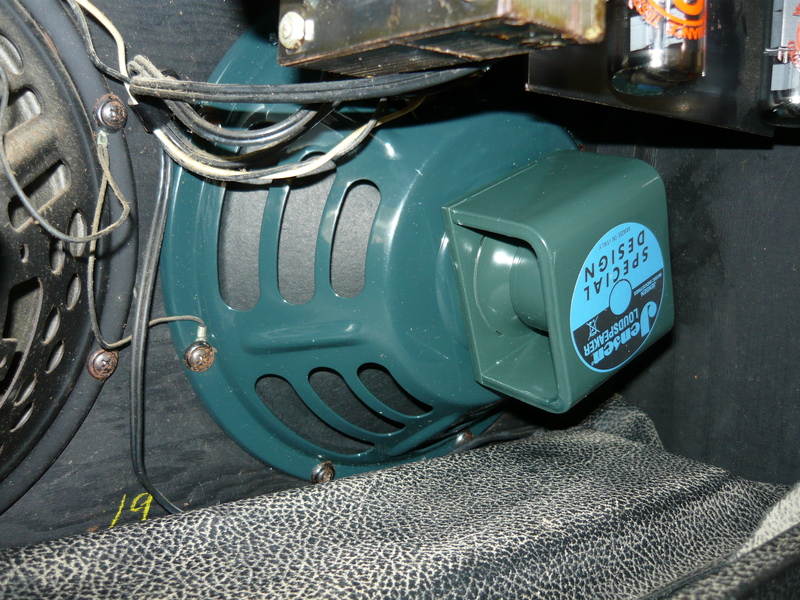 You would have noticed from the first few photos that we have replaced one of the 10-inch speakers with a new (reissue) Jensen P10Q, 40 watt alnico magnet unit. The original speaker had an open circuit voice coil (ie, it was “blown”), but the customer didn’t seem to be aware of this. We quoted on a couple of options, but the Jensen was selected as the most cost-effective option. 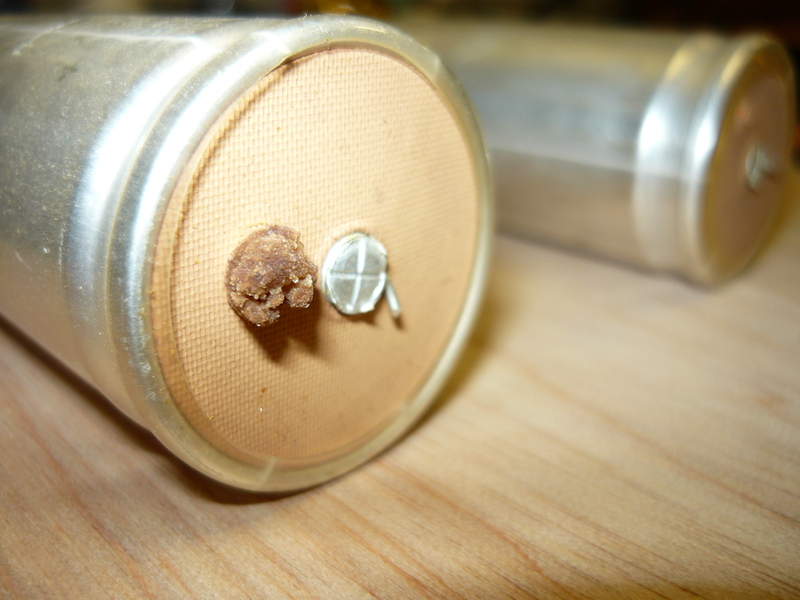 We often find the original Musicman speakers have not lasted as well as the electronics. Right at the end of all this work, one of the apparently OK GT EL34’s failed, so we ended up installing a new matched pair of EL34 output valves & rebiasing the amp. These amps run in class-B mode with 700V DC supplied to the EL34 anodes, so we bias the amp to run a bit cooler than with most amps. Don’t get too hung up about whether this amp or that amp is in class-A, class-AB, or class-B or whatever, these amps sound great and there is no obvious crossover distortion which would add an unpleasant, non-musical edge to the tone. 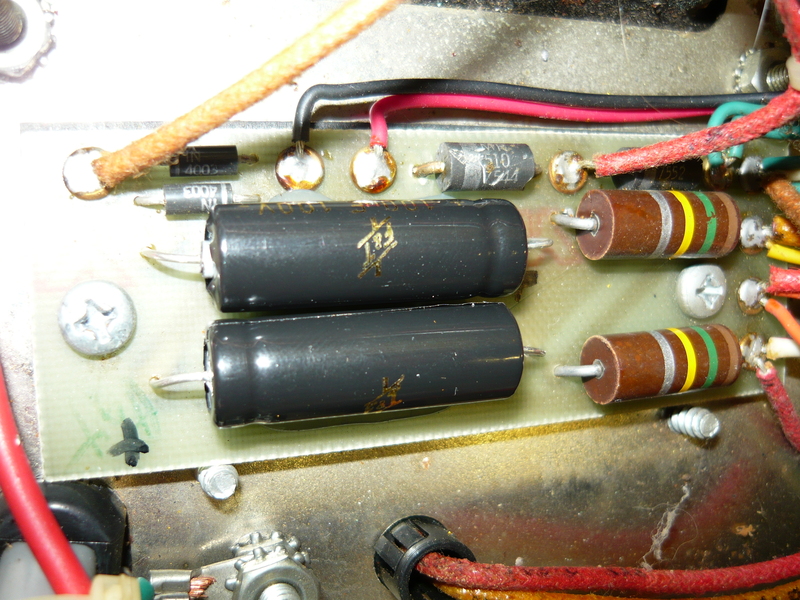 In the final photo for this amp you see the (original) main high voltage power supply capacitors in typical condition, well beyond their expected working life. 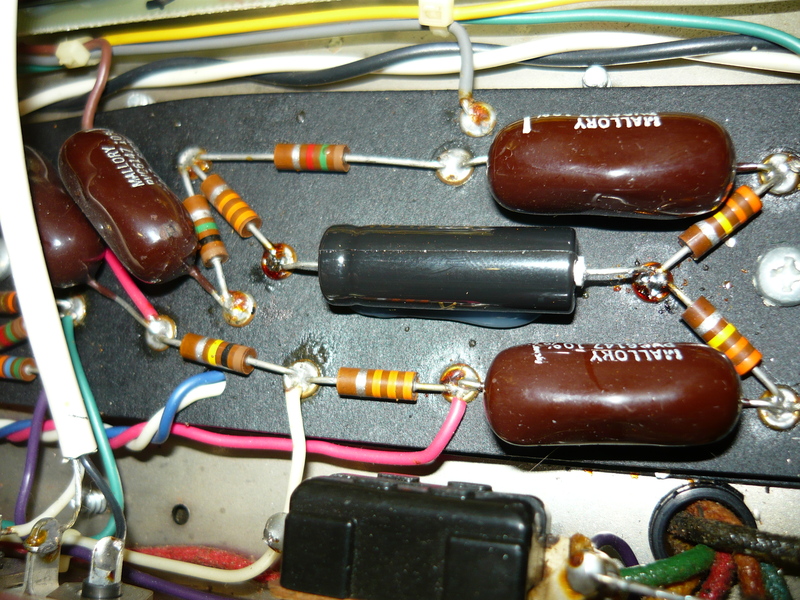 We replace these with a pair of 500V DC can mounting style capacitors, rather than axial, because of their higher working voltage (2 x 500V caps in series = 1000V) and also their higher ripple current rating, which is a significant factor in a voltage-doubler power supply as per the Musicman amps. The caps are bedded down in some silicone so they are held firmly in place. The 2nd of our two Musicmans is like the bigger brother of the previous amp, delivering 130 watts into 4 x 10-inch speakers. The chassis & control panel layouts are exactly the same, just a much taller cabinet, and we would think the date of manufacture is very similar to the 65 watt combo. 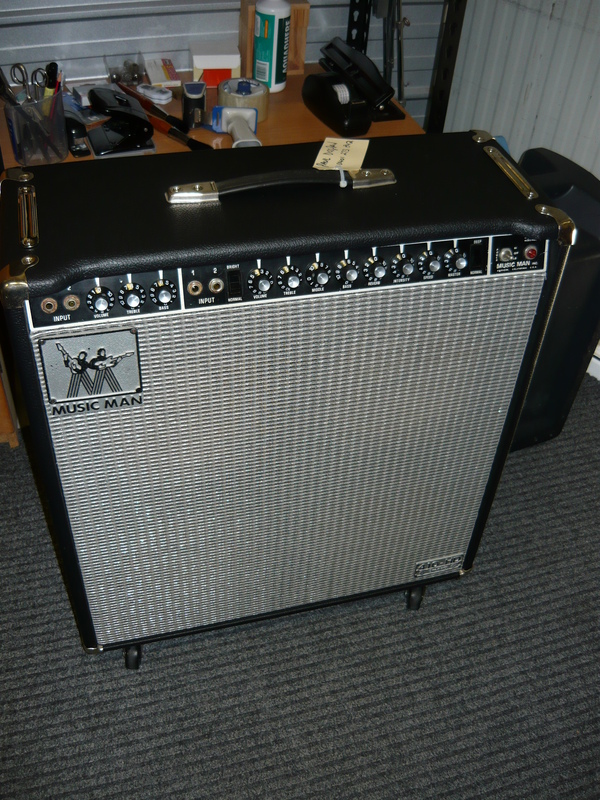 This example came from Paul, a regular central-coast customer of ours, not only for an electronic overhaul but also to have the cab stripped back & recovered with an appropriate vintage-style black tolex. As you can see, someone has recovered this amp (badly) with a ghastly 1970’s vinyl lounge/furniture upholstery, so the amp looks a bit of a joke. The original grille has also been replaced at some unknown point in time. The upholstery has been applied with contact cement – this stuff is very difficult to remove completely. Underneath the upholstery we found there was an earlier attempt at a “natural” finish cab, ie the cab has been stained and a top coat of semi-gloss applied. What a nightmare ! So – every item of hardware, every little cosmetic item had to be removed, and the vinyl stripped off. The cab needed to be filled & sanded before applying the black tolex, and re-installing all the bits & pieces. The baflle was removed, the speakers and the reverb tank put to one side, so the baffle could be sanded a bit, repainted flat black, and a new grille cloth installed. The whole cab was re-assembled and you can see the end result which is very pleasing. The two rear panels were long gone, so Paul helped with some plywood offcuts and his trusty router. 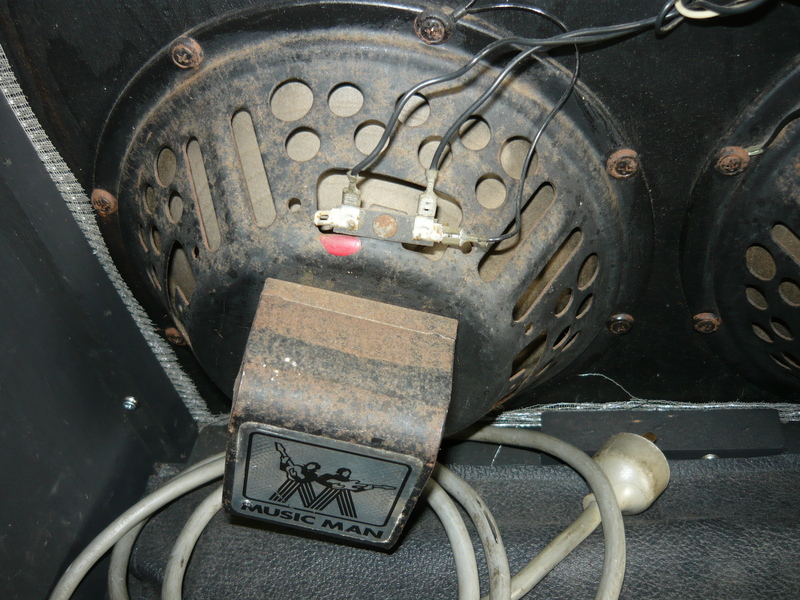 This combo still has the original four alnico magnet speakers, which are in good working order. 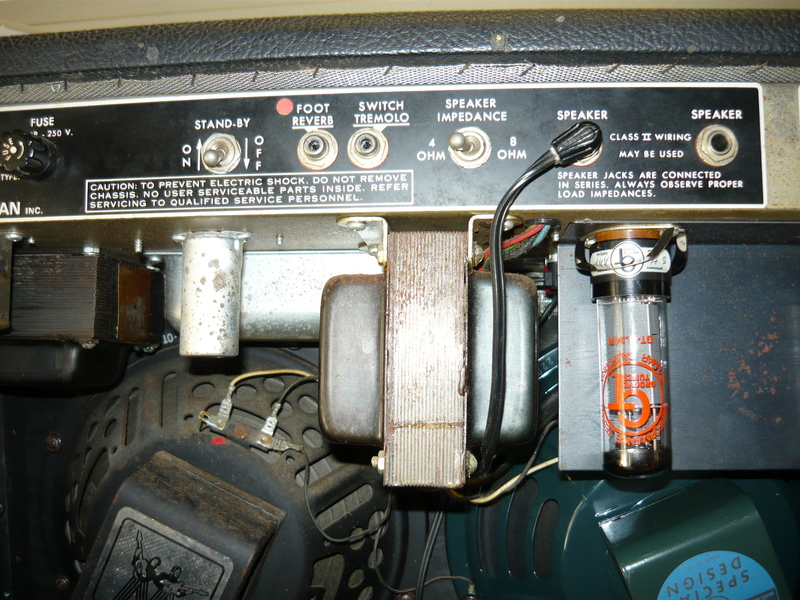 The chassis required all the usual service work: tighten loose transformer, replace 240V 3-pin plug, clean jacks & pots, replaced nine electrolytic capacitors in the low voltage & high voltage power supplies, replaced damaged master volume pot & knob, replaced quad of EL34 output valves & rebias amp. The entire overhaul took well over 10 hours labour to complete, over a period of time, in amongst the many other amp orders etc going on. Take a look at the last two photos, the end result looks terrific ! 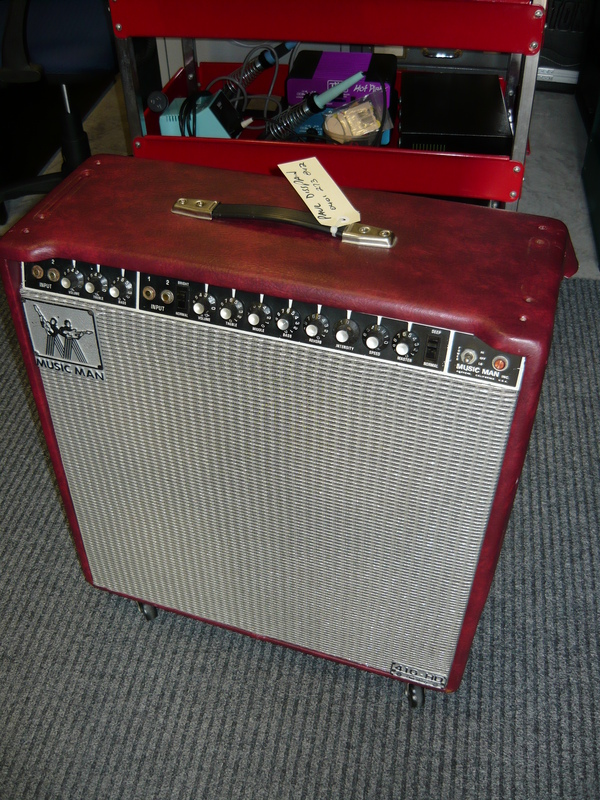 We had to use Fender style vintage repro tolex & grille cloth, as the original Musicman stuff is long gone, but it looks quite convincing and such an improvement on the way the amp looked before. Paul had some of the original and rusted metalwork refurbished & re-plated which made a big difference cosmetically. This amp develops its best sound at quite high volume, so is probably not appropriate for that restaurant gig ! 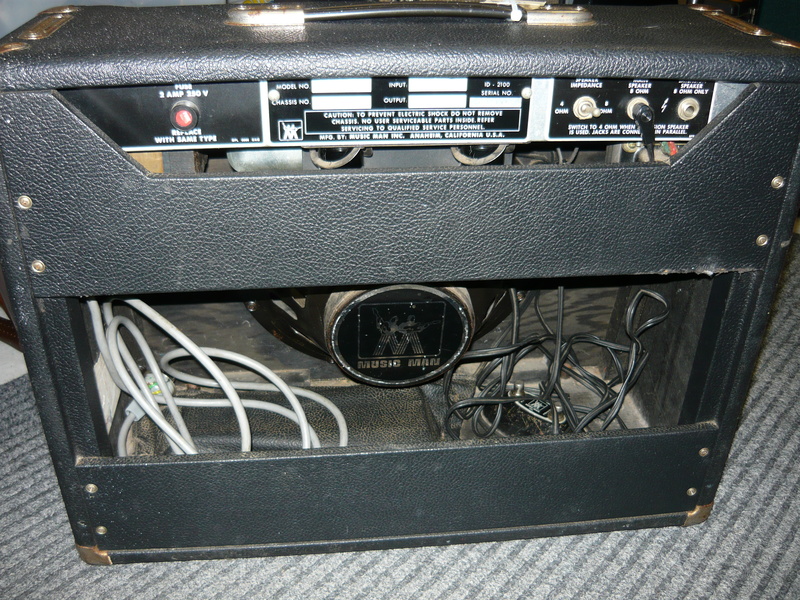 It also makes a good bass amp, as long as you plug it into an external bass cab. Many thanks to Paul D. for his continued custom. Just when we thought it was safe to close off the final paragraph, a third Musicman combo arrived at the workshop for repairs. Only recently acquired by a local musician, this model is a different beast from the previous two amps, introduced a few years further down the track. This model is a single channel design and includes reverb, two FX loops, and most unusually, a built in phaser (spelt phasor !?!?). Well, the phaser is a rarely used effect nowadays, but still it works quite well. 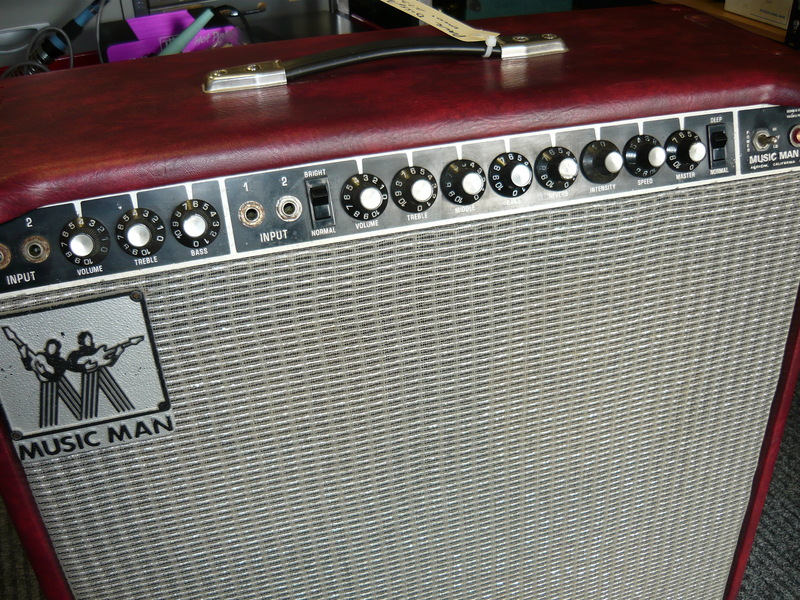 The two FX Loops cater to two different signal levels, but are almost never used by the owners of these amps. The most significant difference to the earlier models lies in the fact that both the preamp stages and the phase-inverter/driver stages in the later amps are completely solid-state, implemented using both IC op-amps & discrete TO220 package power transistors. The power amp employs 6L6GC output valves, as opposed to the earlier EL34/6CA7 valves, operating in pure class-B mode, delivering about 75 watts. The way the valves are driven is also quite different, using small power transistors to drive the cathodes of the 6L6’s. The control grids are connected to the bias supply only. You will notice from the photo here that the speakers have changed from alnico to ceramic magnet. So it’s a slightly different sounding amp to the earlier version. 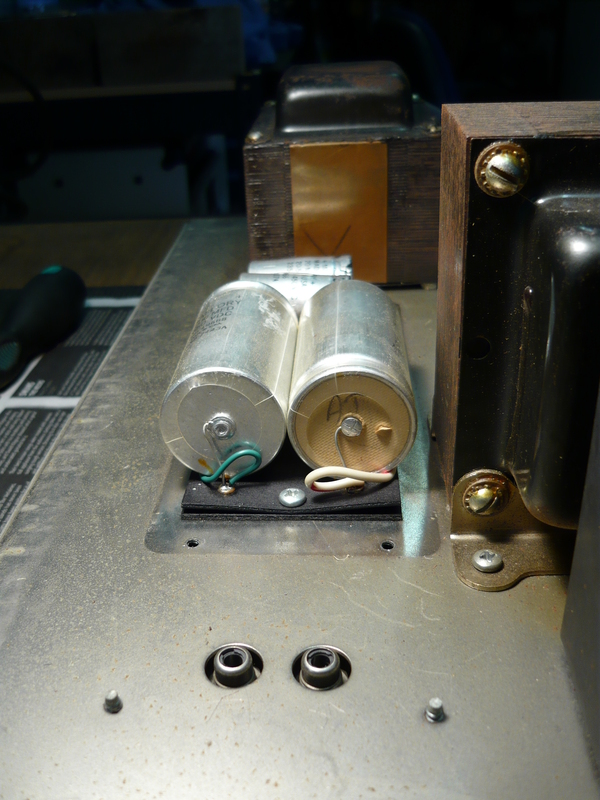 This amp once agin needed a general service, replacement of a damaged pot, replacement of the output valves, and replacement of the pair of high voltage capacitors, which you will see in the next two photos are in a very bad way, and well past their use-by date. Many thanks to the three musicians, plus Bondi Intermusic, who contributed their amps to this blog, by way of submitting them for service to our specialist valve (tube) amp workshop, here in Gosford (Wyoming) NSW. Bye for now – IR. 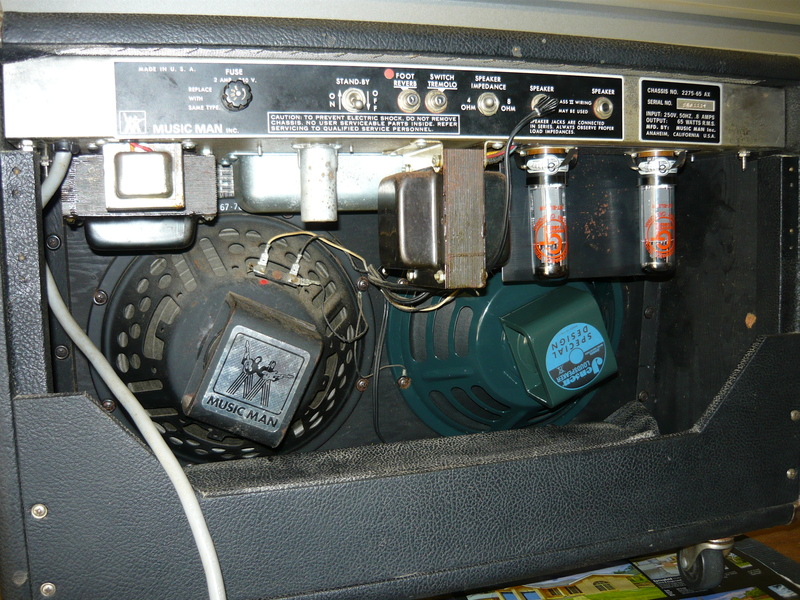 This entry was posted on April 1, 2012 at 5:03 am and is filed under Amp Repair, Amps. You can follow any responses to this entry through the RSS 2.0 feed. You can leave a response, or trackback from your own site. Hi, is it stil possible to buy the knobs for MM amps? 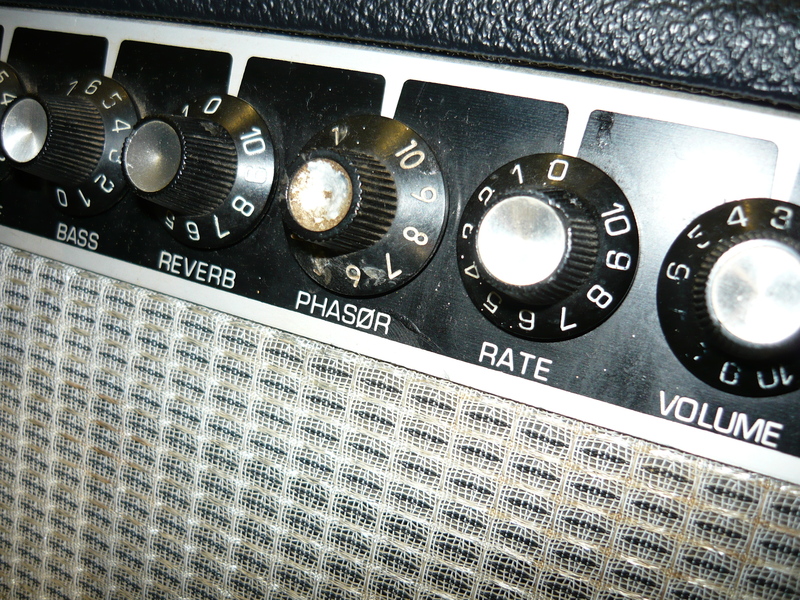 Jeff, the closest knob would be the Fender style skirted/numbered knobs with set screw (not push-on) – IR. Valves [vacuum tubes], transformers, capacitors, amplification circuits found within a guitar amplifier operate at high voltages that can cause permanent injury, disability or death. Valves [vacuum tubes] operate at high temperatures that can cause severe burns. Never attempt to repair, modify, test, work on or touch electronic equipment unless you are trained or otherwise qualified to do so. Likewise, never remove a protective cover from electronic equipment unless you are trained or otherwise qualified to do so. Please remember this blog is intended to be a source of information re your amps, but we are NOT encouraging you to attempt your own service work, which should be referred to suitably qualified personnel only.